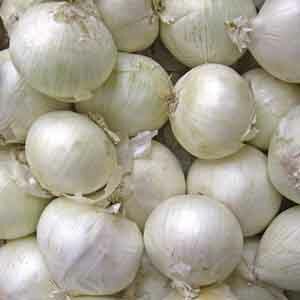 White onions have a sharp, distinct flavor that is ideal for recipes where the rich, savory flavor of onion is desired. They usually have a tender texture that is great for using fresh in salsas or sliced for sandwiches and burgers. Onions are easy and fun to grow, making them ideal for beginners! Superb for adding flavor to soups, stews and casseroles. Great for adding a zesty kick to homemade salsa. Perfect for grilling on shish kebab skewers. Peel onions under cold water before chopping them to avoid teary eyes. Wash fruits, vegetables and herbs thoroughly before eating. Very easy to grow in virtually any location. Space 6" x 18" (15cm x 45cm) apart. Provide ample moisture. When all tops are dead, pull and allow to dry 2 to 3 days on top of soil.